The 7th Week of Philosophy has as its starting point the Revolutions. In the year in which the Russian Revolution celebrates its first centenary, it becomes imperative to make a critical reflection on its legacy. However, our purpose is, on the pretext of the Russian Revolution, to rethink the senses, practices and experiences of Revolution, whether past revolutions or revolutions yet to come. 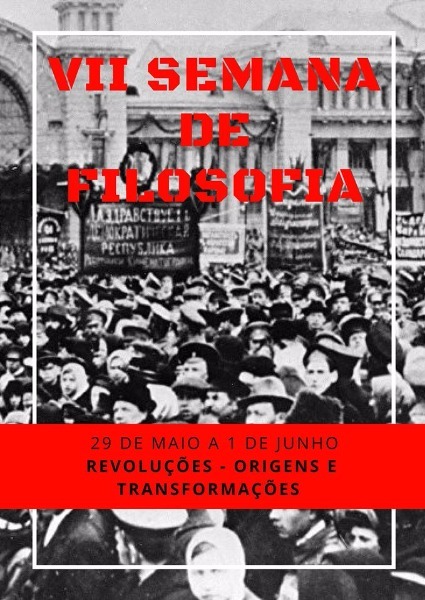 Each day of the Week of Philosophy will have a particular focus, because our purpose is to think the relation between concept and practices of Revolution in several spheres: the social, political, but also economic, cultural and scientific. May 29: Russian Revolution - before, during and after. May 31: Revolutions in Latin America. June 1 - Revolutions in the feminine. In light of previous years, the VII Week of Philosophy has a space reserved for the presentation of works of students, whether of philosophy or other disciplines. The proposed format is that, before each lecture, a roundtable dedicated to the theme of the day will be set up. Each table will have the presence of 4 students. Each student will have 20 minutes for their presentation. We suggest that the presentations be thought of in a more dynamic way, in order to promote the dialogue and questioning among all participants, not reducing to reading texts. Students, submit a proposal of up to 300 words, five keywords and indication for the day / theme.